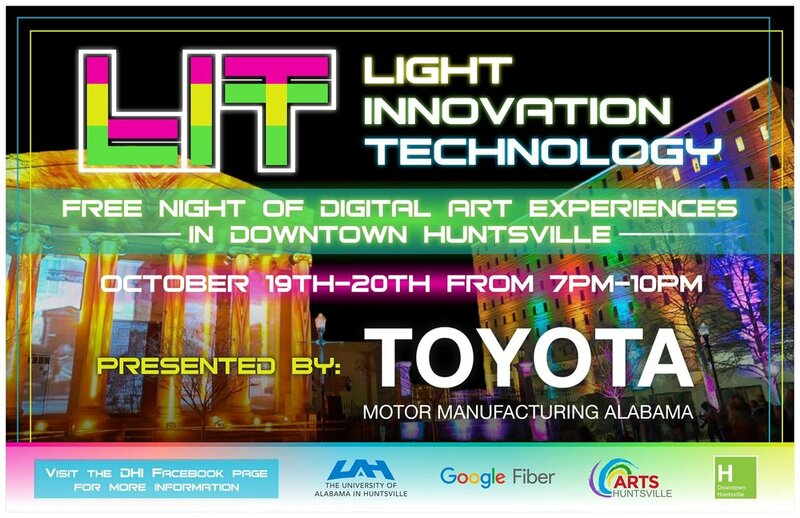 If you are reading this, you might have been one of the thousands of people who enjoyed the 5th Annual LIT: Light+Innovation+Technology Festival this weekend in Downtown Huntsville. Each year, we don’t think we can be more amazed by our talented light artists. But, each year we are. The 2018 LIT was no exception. As we finish up the 5th Anniversary of this signature event, we thought it would be a good time to reflect on the growing success and look forward to the unique possibilities. In late 2013, a variety of Huntsville creative leaders were brainstorming on how to create an event that really embraces the unique nature of Huntsville. During that process, DHI and our friends at Arts Huntsville (then the Arts Council) visited with one of the creators of the Digital Graffiti event at Alys Beach along 30-A. It quickly became apparent that Huntsville’s legacy of innovation and technology could sync up nicely with an event that celebrates those in a visual format. We soon learned that several faculty, staff, and students at UAH were exploring the use of digital mapping as a potential performance technique. 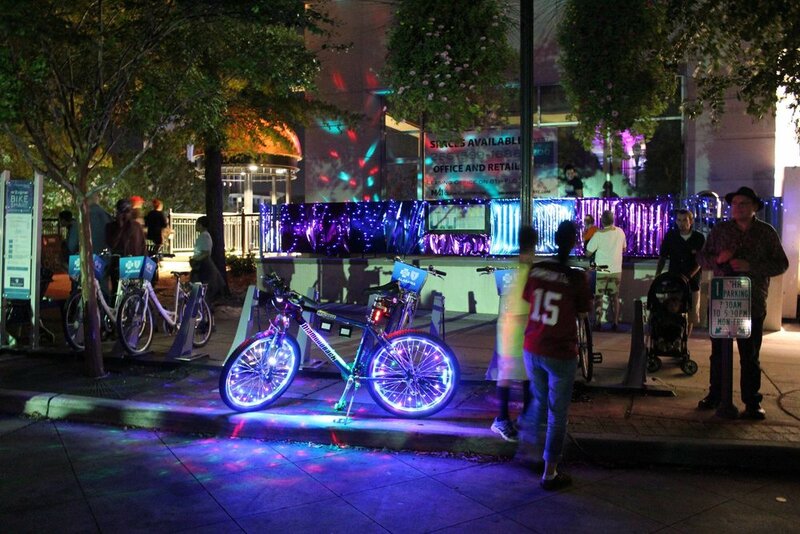 Before long, the concept of LIT was born: a digital light festival that would feature light-themed performances around the Square with UAH serving as the featured artist on Westside Square. The first LIT was held in March 2014 and was a huge hit. It wasn’t without some last-minute drama as it snowed and slushed just days before the LIT debut. Fortunately, the weather cleared and the event amazed over a thousand Huntsvillians with its eye-catching combination of light, music, and visual entertainment. Over the next three years, LIT evolved as we tested new formats and new dates (including an August date in 2016 where Mother Nature decided to bless us with a massive thunderstorm instead of snow). Despite the challenges, LIT has persevered and never been cancelled. 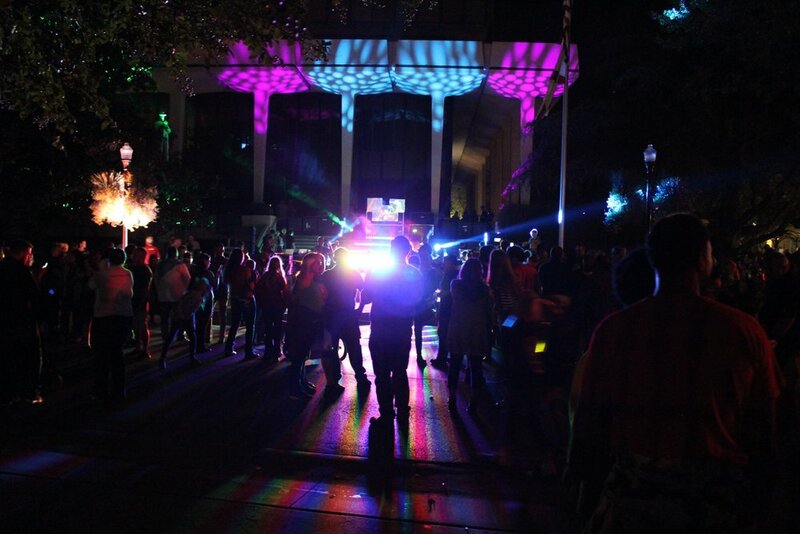 It has become an iconic Downtown Huntsville event drawing thousands of people each year and finding a home in mid-October for the annual evening of fun. The events that are often most successful are the ones that authentically embrace the character of a community. Events that celebrate what makes a place interesting and unique typically resonate more than those that seem contrived or artificially connected to a place. LIT and its emphasis on creatively combining innovative visual displays using top-notch technology does exactly that for Huntsville and its legacy of discovery and curiosity. For the 5th Anniversary of LIT, DHI and Arts Huntsville committed to making LIT bigger, brighter and bolder than ever. Fortunately, our friends at Toyota Motor Manufacturing Alabama share our interest in embracing innovation and technology. Once they agreed to serve as the Presenting Sponsor for the LIT 5th Anniversary, we knew our goal of a big-time anniversary event was possible. A huge thanks to Toyota for being such an amazing partner to this community! We also decided to grow LIT from a one-night event to a multiple night gathering. In fact, the entire month of October has celebrated LIT beginning with the debut of the Musical Light Trees on Eastside Square. The LED-Orange creation allows guests to play the keyboard on Eastside Square and watch the lights in the trees “dance” to the music. LIT 2018 also included an electric Friday and Saturday evening of brilliant lights as Google Fiber created light magic on Northside Square both nights, LED-Orange digitally projected onto the Art Museum, roving light artists from Luminarts roamed Big Spring Park (thanks to our friends at BB&T for making that happen! ), Pints and Pixels had classic games on Westside Square, UAH returned for amazing visuals and many more light-inspired experiences circulated around the Square and Big Spring Park. And, even though LIT Weekend is now in the books, LIT lingers as the spectacular Intrude illuminated bunnies can still be experienced in Big Spring Park through next weekend. In other words, when we decided to “go big” with LIT’s 5th Anniversary, we weren’t joking around. We hope you enjoyed all of the sights and sounds that make LIT such a #SoHuntsville event as we embrace the creativity and innovation that makes our city so special.